Seven years ago, the world was introduced to Michael Bay’s Transformers, and the world of summer blockbusters has not been the same since. While not a fantastic movie; it’s easy to forget how serviceable it was. The idea of adapting the tremendously successful Hasbro toy line to the big screen was a surprising gamble that paid off in a big way. Shia LaBeouf, Josh Duhamel, and John Turturro were still at their peak, the world was introduced to Megan Fox, and reintroduced to the legends that are Optimus Prime and Megatron. For a little while, the sheer absurdity that the movie got made gave the impression that there was something kind of cool about Michael Bay’s overzealously action-packed direction. Unfortunately, it got old very fast. Three overblown, noisy, overproduced, and other adjectives your grandparents use to describe the garage band down the street, sequels later, we have Transformers: Age of Extinction. Gone is Shia LaBeouf, who is, of course, not famous anymore. Gone is Megan Fox and Josh Duhamel, both of whom have been replaced by various, physically identical characters. Gone is executive producer Steven Spielberg, whose idea for the heartfelt connection between boy-and-alien gave the original a soul. Gone, in fact, are most of the autobots and deceptions we’ve come to, well not know, really, but vaguely recognize over the course of the series. They, as we’ve come to discover, have all been hunted down and murdered by the NSA, led by Kelsey Grammar, who have branded the transformers (who, for what I think is the first time in the series, are actually identified as such) as enemies of the state after the debacle in Chicago that ended the last movie (which, by the way, was the culmination of an almost identical plot line). It’s not a bad premise, Bay understands the same philosophy that currently fuels the GOP; the government makes for an interesting villain. We’re almost tempted to agree with Grammar after seeing all the carnage from the previous movies. But then you’d think after three movies of the same story, they’d have learned; without good robots, whose going to protect humanity from the bad ones? The short answer; which is spoiled early enough that I’m not giving anything away, is that the government is working with them; or rather with one nasty robot with a sniper rifle for a face, who is gunning for Optimus Prime (voiced once again by autobot veteran Peter Cullen). Upon taking disguise as a broken, derelict truck, he is taken in and fixed by Cade Yeager (Mark Wahlberg) and his daughter Tessa (Nicola Peltz). 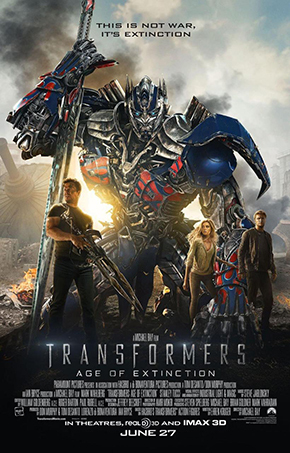 They are eventually discovered by a prominent NSA agent (Titus Welliver), one thing leads to another, and eventually Optimus is riding a gigantic mechanical Tyrannosaurus Rex. This event should be a spoiler, because it takes place long after the movie should have ended, but it’s on all the marketing and it’s probably why most people are going to watch it. It’s practically an afterthought in the actual movie. There’s a subplot where an appropriately slimy Stanley Tucci begins making robots for the government, and one of them, affectionately named Galvatron (Transformers fans can interpret what part he plays in the story) fights Optimus, who laments that Galvatron is an overproduced monster that has “no soul!” It’s a fitting metaphor for this movie franchise. In many ways, the stakes are higher in this movie, the invincible Optimus is more vulnerable, and the special effects are impressive as usual. Mark Wahlberg does his best, but its clear that the real stars are the special effects. The problem is the movie lacks a beating heart beneath all it’s insanity, leaving the audience with a shallow group of characters that are mostly uninteresting. Besides the always-fun Bumblebee, the autobots are a two-dimensional group of mostly unlikeable characters, and the humans are not that much less robotic. The caveat with this particular movie is how it manages to test the resolve of even those who find this madness appealing. At nearly three hours; filled to the brim with explosions, drab-looking ships, and screaming; it’s truly a strain on the mind, even for the most patient. Optimus, who in the first film advocated peace towards the humans above all else, now yells “I’ll kill all of you!” several times throughout the movie. There’s a semi-interesting parallel between Prime and Grammar; two outdated individuals trying to protect a country that wants to replace them. It’s probably this fear of getting replaced that convinces Prime to fight the new machines by embracing the old; donning a shield and sword and riding a robot dinosaur. The problem is, that’s among the more ridiculous sentences I’ve written. Even then, the problem isn’t how ridiculous it is, but in how it refuses to be fun. In hopping between extended bouts of Optimus kicking robots in the face during thirty-minute long action scenes, and silly shots of Mark Wahlberg shooting at enemies with a sword; its easy to get whiplash between scenes that are dark but not that dramatically resonant, and scenes that are dumb but not that much fun. Add in the fact that you’re also paying for the same poor acting, schlocky dialogue, geologically unconscious editing, and inconsistent abilities that have become commonplace in this franchise and you have yourself, well, a transformers movie. Only with dinosaurs this time. If that’s the kind of movie you want to see, then by all means do so. Just be aware that there aren’t as much dinosaurs as you would think, and also you should bring an aspirin.